At the Virtual Infrastructure Type step of the wizard, you can choose to connect a vCenter Sever or Hyper-V infrastructure server (Failover Cluster, SCVMM, Hyper-V Server). To configure connection to a virtual infrastructure server and initiate automatic data collection from this server, select the virtual infrastructure server type and click Next. 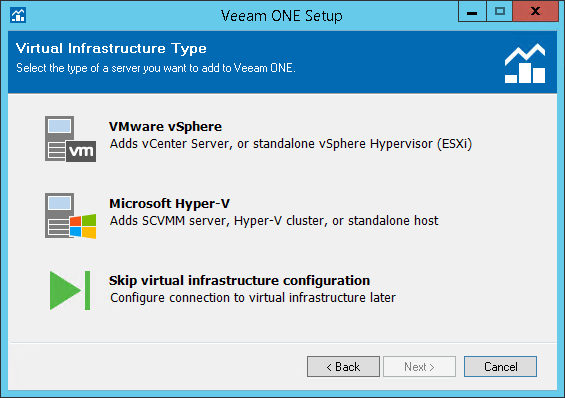 If you do not want to configure connection settings during installation, you can skip this step and configure access to virtual servers later in the Veeam ONE Monitor console. In this case, click Skip virtual infrastructure configuration and click Next. If you choose to configure connection settings, the Veeam ONE Setup wizard will include additional steps to connect to a virtual infrastructure server and to a Veeam Backup & Replication server. If you choose to skip infrastructure configuration, you will pass immediately to the Data Collection Type step.